Like many of you, I spend the first days of school talking about procedures, rituals, and routines in the classroom. Within that spectrum, lies the rules of my room. I go into my year knowing the rules I want ahead of time. I know there are some schools of thought that say you should come up with a class set that the students brainstorm. Now, while I think that is a fabulous thing to do, it does not fit my control freak teaching style, so I don't actually do that. What I do do is go through the brainstorming process with my students on the first day of school and guide them to my predetermined rules. Basically, it works like this. We all get together on the rug and I ask the students what they think the rules of the room should be. They tell me everything under the sun. As they are doing that, if there are any lulls, I interject with a "suggestion" and add it to the Circle Map. As time goes on, I discuss with them how we need "umbrella" rules that will sort of capture a whole bunch of these into one main topic. They get it, and we start to narrow down the millions of rules to just 5. Inevitably, these are the 5 we end up with. The next day I have the students sort the "little" rules under the 5 main umbrella rules using a Tree Map. I just type up the ones that the kids suggested on the Circle Map and cut them out. This sort does a few things. 1) It shows the students that yes, these big umbrella rules do include many of the things that we had said the day before and 2) It shows me how the students work together. Click here and you can get the 5 rules, as well as the Tree and Circle Maps I use in my class. This year, I am going to do another activity that I haven't done in quite some time, but feel is valuable. I am going to have the students create a "My Classroom Rules" Book. In this book, they will write each rule, then draw a picture of what it looks like and what it DOESN'T look like. Then they will give examples and non-examples, plus write ways that they themselves will follow the rule in class. I did this a few years ago (and many computer crashes later...so no pictures of completed ones, sorry!) and I think the students really internalized what the purpose of these rules were in class. Here is the book template I am using. I used the Kevin and Amanda fonts again...I told you, I am obsessed. So there you have it. These are a few of the things that I do with regards to classroom rules on the first few days of school. What do you do??? Please share your ideas! We are a PBIS school and so the first days of school we arent just discussing classroom rules, but PE, music, library, guidance and Art teachers are doing rotations with other "activity" or non homeroom teachers to discuss expectaions of hallway behavior, cafeteria, recess, bathroom and the principal even loads them onto the bus to discuss expectations ! They hear the same thing every year-- twice a year (usually after Christmas too) about STAR student behavior. I love that everyone is involved. We do this too except we do it after every single break as well to ensure it is reinforced. We also have a positive aspect in that if someone notices my class is doing a really good job at walking in the hallway when this is something we've struggled with, my kids can earn a "STAR" for the classroom and they are put into a drawing for the STAR Cafe at lunch on Friday. It's nothing more than sitting at a special decorated table and having a trophy in our room for the week but the kids LOVE it. Each class in my school uses the same rules. Each year I explain to the class that even though some of my procedures may be different, the rules are the same. I really like that you have taken it much further. I've noticed that the kids seem to get more impulsive each year in the area where I teach. I think your idea is excellent for getting the kids to be more reflective. Thanks for sharing! Love this handout, especially with the non-example! This will fit in great with the modeling my ELLs do...thanks so much for sharing this! Oh, thank you for sharing this! My class has done something very similar by contributing desired rules and then narrowing them down to five, but I have never used the reflection booklet or the sorting activity and I love them!!!! I am so appreciative! I love that you use thinking maps for your class rules... I want to do this with mine! you are inspirational! and we all try to decide what the text should be. Ha! I feel the same way. I posted about this, too. I use whole brain teaching and really got tired to swaying them to the right rules. Now I just lay it out! Love these files and using in my 2nd grade room! Love this! In our school we use PBIS and fill in a matrix explaining what "Respectful, Responsible and Ready to Learn" look like in our classroom. 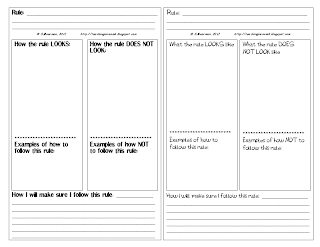 I love the idea of having the students state the rules they think are important and showing them how they DO still apply! This is a great idea! So often kids don't know which rule their behavior has broken or why. (Though they sure can point it out in a classmate!) This is a great way for them to think it through right from the start. I will definitely use this! Thanks! I have always had my rules preplanned too. They always get there with a little guidance. I love the way you have them sort out the little rules under the umbrella rules. Very smart! I started using Whole Brain Teaching last year and we switched to the 5 rules that go with that program. I love it and it may seem redundant but my class recited the rules all the time. I say "Rule #2" and the go "Rule #2: Raise your hand for permission to speak." Ha! It's hilarious when we do it in different voices. There are gestures to go with it, so we keep it fun, but they do internalize the rules. The best part, when they break a rule I can hold up 2 fingers and they just stop talking. Awesome! What a great idea for an older classroom! I use a similar technique to yours in my classroom. We discuss what rules make a classroom where everyone can learn and feel safe. We brainstorm the rules (and I do steer them in the way I want them to also!) I find that students would be much stricter than what I want and harsher in the consequences! We also practice and model what the following the rules looks like. This year I'm also adding taking students' pictures modeling the rules and posting the pics with the rules. 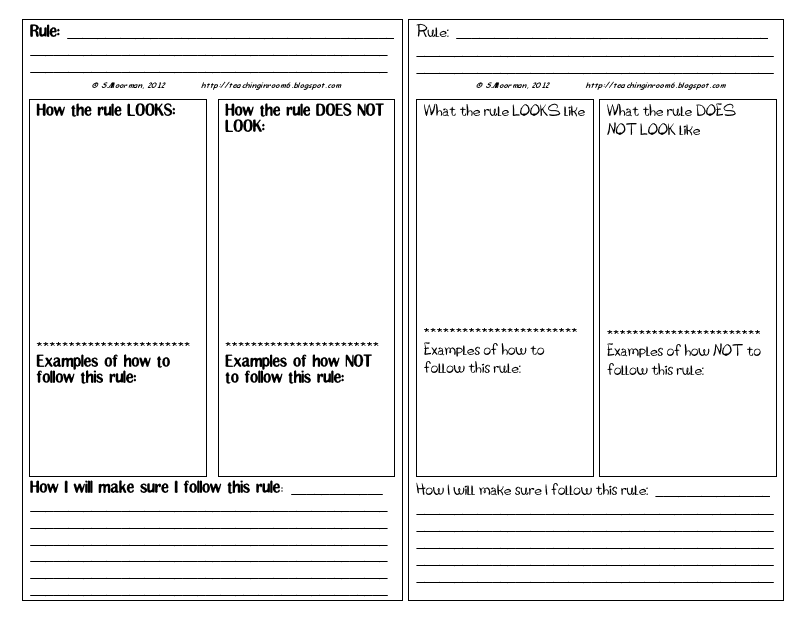 I have my students sign the rules chart to show that they were involved in creating them and will abide by them. Stephanie, I love your take on this! Thanks for sharing! Great ideas, thank you for always sharing your templates. I've been following your blog for some time now, and absolutely love it. Thank you. I have to be honest. I am too much of a control freak to have the students make the rules, even if I were to guide them there. I have my rules that I go over, but we do discuss how the "little" rules all fall into the ones I have listed. Since we are a PBiS school, we have to use the school rules to be consistent (but they were developed as a staff so that's fine). How we make them our own is by having the students work together to list what the features look like in our rooms. It's similar to what you have here...we use Thinking Maps too and I am going to steal the idea of having the kids do this with the thinking maps also to help reinforce the rules and expectations! Love your book idea. I have a favor to ask - I am the Library Media Specialist and would love a pdf that said Library Rules. Would you me able to make the change and email me? Hello! I'm a visiting guest presenter for science and nature,k-4. I would love your input on how to enter the classroom and reinforce these "rules".I'm only there for one hour or less. This is my first year and I found that my style does not work well. I see how hard the teachers work for order. I want to contribute to that order but how to do it, without taking away form my presentation or dampening their spirits for science. Confession:I like to get them to jump in and tell me but I have learned that the teachers do not appreciate this style and now I get it. I'm working on improving any suggestions? Thank you so much for your time.